I’m always on the lookout for exciting online ideas and websites that can enhance our lives. 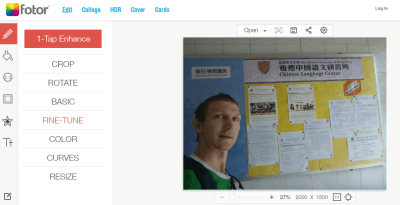 For anyone keen to edit and enhance their travel photos, check out Fotor. 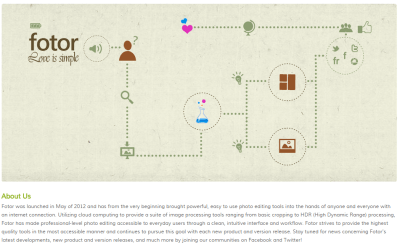 It’s a website that was first launched back in May 2012 and aims to provide an easy to use platform for photo editing. Some of the main features of Fotor including cropping photos, HDR (High Dynamic Range) processing, photo editing, photo effects, clip art, cover making for Facebook and Twitter, plus all the things I’ve listed below. Fotor can be used by the complete novice like myself – it has made professional-style photo editing accessible to basic everyday users. The website is easy to navigate and has an intuitive interface. I especially like the Tilt Shift feature. Fotor aims to provide the highest quality editing tools in an idiot-proof accessible manner and continues to pursue this goal with each new product and version release. Fotor is always being updated and I urge you all to give it a try. As long as you have internet, signing up and using the platform is free and please don’t confuse it with the Montenegrin town of Kotor. I like Fotor. It’s a good online photo editing tool. To edit any photo instantly, I prefer using Fotor and Canva tools.